Lewis Cook up against Clayton Donaldson in Leeds United's latest game against Birningham City. All the talk has been about being patient and that Uwe Rosler was the right man to take Leeds United forward. That patience, however, is being tested after the Whites suffered their third defeat in four games, failed to score at home again and slid to a slightly worrying 16th place in the Sky Bet Championship table, only three points above the drop zone. In the build-up to the latest game against Birmingham City owner Massimo Cellino appeared to give his head coach a vote of confidence and there does appear to be a more considered approach this season than the first in the Italian’s reign. With just two wins from the first 10 league matches and an average of less than a goal a game it is difficult to believe that Rosler would not be under big pressure or gone if this had been 12 months ago. 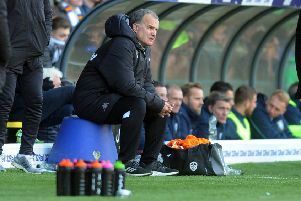 The early promise is certainly disappearing fast, but on the surface there is still calm at Elland Road and no panic, just determination to put things right that have been going wrong in the past month. Cellino has gone on record at being impressed by the way Rosler has gone about his business. He said: “I have not set a target of a position to finish in this season, simply to continue seeing the team being built in a way that it can grow for the future. “I feel that Uwe Rosler is doing a very good job in helping us in that direction – I’ve been pleased with his work so far. “We have a good relationship and I have been impressed with how professional he is in all aspects of the job. While there is no target, Rosler knows results will have to improve and he is pleased to have a bit of breathing space now with another international break this weekend. This will give him some time to work with his players on the training ground. One worry must be a lack of goals with the heavy reliance already on strikers Chris Wood and Mirco Antenucci, who have seven between them. At the back they have not looked secure in their last two games while in midfield the right balance has not yet been found so there are problems to be solved in all areas of the team and a little time out can only help Rosler in his bid to sort things out. There was one bright spot from the game against Birmingham, however, in the home debut of Jordan Botaka, who looked lively when coming on as a second half substitute, although he could not quite supply the crosses or shots Leeds needed. “He did a lot of good things but needs to improve his final ball,” said Rosler. Rosler felt Buckley would benefit from his 55 minutes on the pitch after being frozen out by parent club Sunderland. He added: “I felt Will was lively, but we never really got him in a position – or he got himself in a position – that he could run at defenders.